The Congressional Budget Office (CBO) Jan. 25 released new projections showing a widening gap between incoming revenues to the Highway Trust Fund (HTF) and the amount needed to preserve exiting federal surface transportation investment levels following the 2020 expiration of the Fixing America’s Surface Transportation (FAST) Act. Prior to the FAST Act’s Dec. 4 enactment, the HTF was facing average annual revenue shortfalls of $14.6 billion. Beginning Oct. 1, 2020—when the law expires—the gap will average $18 billion annually over the next six years, according to CBO. The FAST Act supplements HTF revenue with a $70 billion transfer from the federal General Fund. 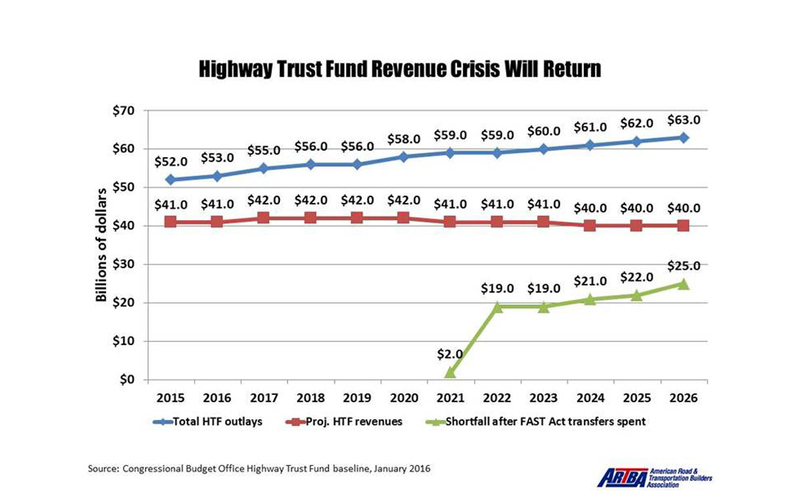 The new CBO data reflected in the chart above demonstrate that while this Band-Aid approach will support the FAST Act’s modest highway and transit investment increases up to 2020, it will leave the trust fund in a worse fiscal predicament.